Green Heating and Cooling | Solar Hot Water | What is solar water heating? You use hot water at home every day when you take a shower, run a load of laundry, or wash your dishes. 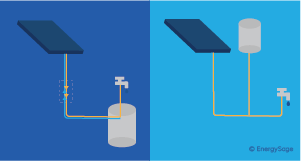 Solar water heating systems use the sun’s energy to heat the water in your home. With a solar hot water system, you can use the power of the sun to save money reduce your reliance on conventional energy sources such as oil, electricity, and gas. Solar hot water cuts down on greenhouse gas emissions in the atmosphere, and also helps you save money long-term by reducing gas and electricity bills. Solar hot water systems capture thermal energy from the sun and use it to heat water for your home. These systems are made of a few major components: collectors, a storage tank, a heat exchanger, a controller system, and a backup heater. The panels in a solar thermal system are known as “collectors,” and are typically installed on a rooftop. These collectors are different from the photovoltaic solar panels you’re probably familiar with, because instead of generating electricity, they generate heat. 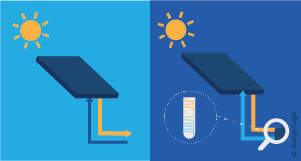 Sunshine (or “solar radiation”) passes through a collector’s glass covering and strikes a component called an absorber plate, which has a coating designed to capture solar energy and convert it to heat. This generated heat is transferred to a “transfer fluid” (either antifreeze or potable water) contained in small pipes in the plate. Collectors come in different sizes. The size and number of collectors you’ll install depends on how much sunshine your roof gets and how much hot water you use in your home. They are also made in two styles: flat plate and evacuated tube. Flat plate collectors are generally less expensive, but can capture less sunlight and are less efficient in colder conditions. Evacuated tube collectors take up less space on your roof, but are heavier and more fragile. Once the transfer fluid in your collectors heats up, it moves into a series of pipes known as a “heat exchanger,” which is located inside the storage tank for your hot water. When these pipes are filled with heated transfer fluid, the heat is transferred from the pipes to your water, making hot water that is ready to be used in your home. Most solar hot water systems have a controller system that ensure the water in the storage tank doesn’t get too hot. Controller systems can also prevent cold water from being cycled through the system when it’s extremely cold outside and the transfer fluid isn’t being warmed sufficiently. Lastly, every solar hot water system comes with a backup system. On days when it’s too cloudy to generate enough heated water from solar energy, your backup heater will kick in and generate hot water for your home with gas or electricity. Backup heaters will account for roughly 20 percent of your hot water use throughout the year. Every solar hot water system is made up of the same basic parts, but there are some differences in system design. You have to choose between a direct or indirect system, which impacts how fluid that is heated in the collectors. You also have to decide whether you want an active or passive solar hot water system, which impacts the way that fluid moves through your system. The main difference between direct and indirect solar hot water is the type of fluid used to collect heat in the system. 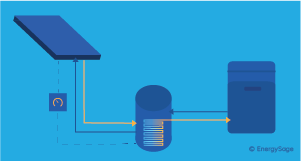 In an indirect system, solar energy is collected and held in a special antifreeze fluid. The antifreeze is circulated into your hot water storage tank, which heats water for use in your home. By comparison, in a direct setup, your water gets heat directly from the sun, rather than being collected in a transfer fluid first. Most solar hot water installations in the United States use indirect solar hot water systems. Indirect systems are more resistant to cold temperatures, and are better at retaining heat energy during colder winter months. However, indirect systems are also more expensive than direct systems. Direct solar hot water systems may work for some homeowners in the most southern parts of the country, but most U.S. residents will want to install an indirect system to avoid efficiency losses during colder parts of the year. In your solar hot water installation, antifreeze fluid or water is moved throughout the system with a controller pump or with gravity. Controller pumps are only used in active solar hot water installations. Passive systems rely on gravity to move fluid and water around. While passive systems are less complicated to install, they are also much less efficient than active systems. Additionally, some passive systems need to have their storage tank installed higher up than the collectors to work, which can put high amounts of stress on your roof. Most solar hot water systems in the U.S. are active, meaning that they have a controller that pumps water or antifreeze fluid through the system.